Climate in Nice - When is it best to go to Nice? What is the Climate in Nice, France? Before referring to climate tables, one should be aware that the official Nice temperatures are recorded at the airport, which is a climatically different place than the rest of the town, being more vulnerable to marine air and winds from the Var valley. Airport temperatures are therefore different from town ones : daytime airport temperatures are slightly higher, while nighttime temperatures are significantly lower. For example, on the 24th of January 2007, a minimum of 0.9°C was recorded at the airport while the temperature didn't go below 6°C in the city itself. The following statistics and descriptions use official temperatures. 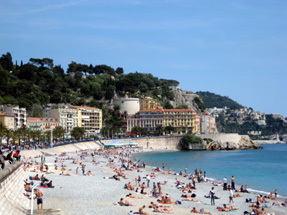 Nice has a Mediterranean climate : the city enjoys mild temperatures most of the year; rainfall is very moderate and mainly concentrated in the darkest part of the year (September to March). Winters, starting in December, are cool to mild with daytime temperature generally remaining between 10°C and 17°C and colder overnight lows. However, the temperature rarely reaches freezing point, which occur only once or twice a year. During winter, overcast skies are common and sporadic rain falls. As winter ends in March, weather becomes more unstable and unpredictable : warm, sunny days (26°C the 2nd of March 2007) can be followed by sudden hailstorms and cold fronts (7°C the 1st of April 2007). However, generally, the weather becomes increasingly sunny as summer approaches. Summers start quite late because of a notable season lag. Drought starts in July, and really hot temperatures become common in August, which is the warmest month with daytime highs frequently reaching 35Â°C. Summer heat is however often moderated by a cool and pleasant sea breeze. Autumn, starting in late September, is generally warm until mid-November, and rainy (especially October with an average rainfall of 140mm). Nice is a windy city, especially in spring. Snow is so rare that it is remembered by inhabitants as special events.